The creek is out of its banks in the bottom of my meadow, and there's more rain to come. Memphis Minnie, the Beatles, the Dead, so many great songs about it come to mind. Time to seek higher ground, people. Oh, and Stevie Wonder, too. As promised, the bear. I wish I could pull out the video archive in my brain, as I drive fairly slowly out Brewer Road, and think "damn, that's a big dog" and slowly come to the realization that it ain't a dog. Or a person in a bear suit. 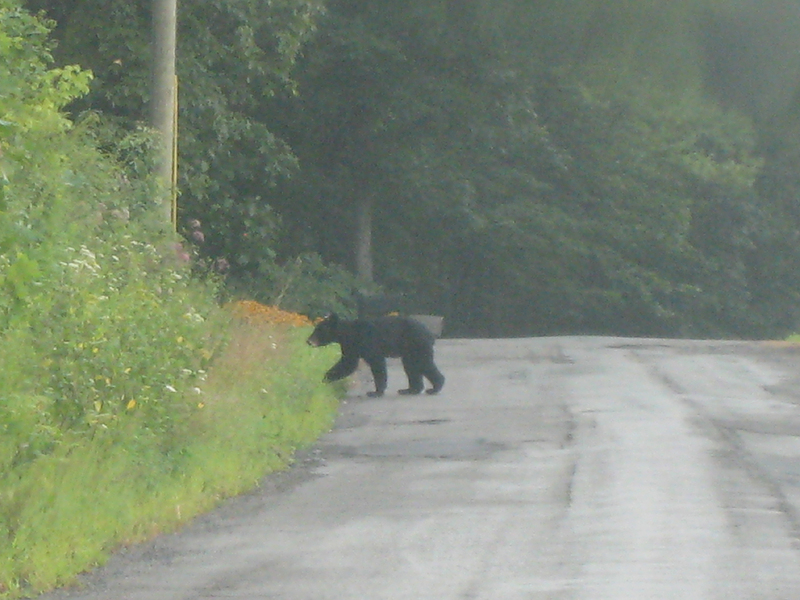 And I gotta thank the bear for cross the road a couple of times while we sat in the car, desperately fumbling for cameras, snapping shaky useless shots. Tomorrow off to Petersburg and Thursday it'll be Wheeling, so I will probably finish Devil in the White City as I listen and drive. Remind me to put away the lanterns and campstove, which I got out during a few hours with no power yesterday after work. And I need new mantles for one lantern. Never buy more than one set of mantles at a time, Grasshopper, because you'll never in your cotton picking life be able to find the second set when years later you actually need it.